Generally a player will open the bidding if their hand contains 12+ points and pass if their hand contains fewer points. Sometimes, though, you might be tempted to open the bidding with a hand containing fewer than 12 points. You need a way of deciding if this is sensible option and this is where the Rule of 20 comes in. Add the number of High Card Points in your hand to the length of your longest two suits. If teh total is 20+ you have satisfied the Rule of 20 can open the bidding if you want to. Our hand has eleven points. If we add this to the length of our two longest suits we get a total of 20, so we can open the bidding if we want to. This is a tempting looking hand. It has honours in every suit. Can we open the bidding? It contains 11 points, but if we add that to the length of our longest two suits we get a total of just 19. This doesn’t satisfy the Rule of 20 so we must pass. You can practice the Rule of 20, and learn the many other bridge bidding rules and techniques if you join No Fear Bridge for your two week trial membership. Whichever site you join, you will be asked to fill in a simple form and choose a username and password. No financial details are taken unless you decide to continue your membership. 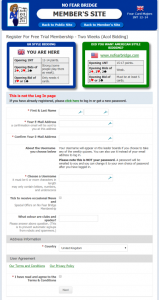 This is what the joining form looks like – just a quick form to fill in. Agree to the T&Cs, click next and your trial membership starts immediately.